I never thought I'd say this, but we're having trouble eating our one-fourth bushel of CSA produce before the next delivery arrives. $16 brings a lot of food. To prevent waste: more omelets, pasta salads, and of course, tacos. Tacos are a great way to use it up! We did a CSA two years, and now we hit the farmers' market hard, as well as family gardens. I've learned to put vegetables in EVERYTHING. LOL. Seriously. The scrambled eggs have tomatoes and peppers and sometimes chard. The rice at supper has herbs stirred in. Soups can hold an enormous amount. Every meal I make, I think to myself, what could I add to this? You'll be surprised what you can come up with. Some of our favorites have happened because of this...enchiladas with chard anyone? We love tacos in our house. We eat them about once a week. 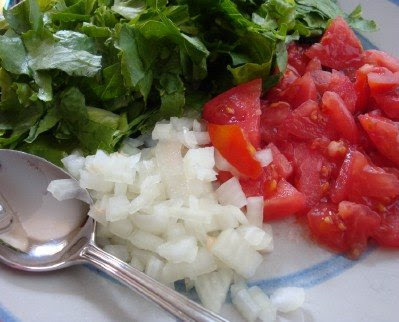 Another thing you can make with tomatoes and onion is salsa. We love that. I use it on the omelets, with chips, and in a meat loaf...it is just plain good. we do oodles of tacos, too. also, i roast up pans of vegetables. just cut up, drizzle w/ olive oil and salt / pepper -- add cumin and fresh squeezed lime if for Mexican food, or lemon and other herbs if you like for something else. these are wonderful for filling tacos, burritos, enchiladas, alone as a cold salad, in pastas, in eggs, etc. we also do a fair bit of hash w/ potatoes, peppers, greens.... oh, and Betsy, we LOVE greens of nearly any kind in our enchiladas! we make some w/ greens, sweet potatoes and black beans. Can you trade/barter with family or neigbors? A basket of fresh produce in exchange for some extra perennial plants your neighbor is thinning and splitting? How about a little table curbside with a basket of produce and an honor box? Just brainstorming here, I'm envious of your surplus!! Have you thought about canning? It's an investment in msome materials and does take time (then there is the issue of storage). Do you have family/friends that would be interested in sharing the cost (and results) with you? Another way I enjoy using up veggies; dice a variety and mix with a little balsamic vinegar, olive oil, salt and freshly ground pepper. Eat as a side dish, toss with pasta, or scoop up with crisp tortilla chips. You are making me crave tacos. Too much produce is a good thing, right? I would probably have to make and freeze gallon batches of salsa because I would never get it all used up! Looks fabulous! This is a good problem, no? Don't forget about fried rice. You can put anything in it. And soup, anything goes with soup. That looks delicious! There is just something about really fresh foods. Good problem to have, I am a bit jealous! Oh I wish CSA was an option for us. It'd be an hour drive, one way, and I just don't think I could justify it. I am green with envy. Serve with taco shells or as a salad. fish, taco/chips, lettuce, tomato, onion, avocado chunks, peach salsa, and any of your other favorite toppings. We love them. Our 2 year old eats them up. We also get these really thin shells from Fareway (grocery chain in Iowa) that are easier for her to chew than the classic taco shell. Brand is La Tiara. I'm thinking of joining a CSA so that we're forced to eat more veggies. I hate wasting food, and I really could stand to eat more produce. Sounds like it's win-win all around! I wish we had a CSA near us. Closest one is about 60 miles away. I had problems using the fresh produce I bought a couple weeks ago. Before it went bad I prepped it and put it in the freezer -- shredded zucchini, chopped green pepper, a pepper and onion mix for fajitas and made a cucumber salad for lunches. Sounds like you're being creative in the dishes you make in order to use up the produce. You can add veggies to lots of things -- soups, pasta sauce, salads, eggs, veggie quesadillas or burritos -- the possiblities are endless. Re: a thought triggered from your Food for Thought linkage. We put chopped kale in our spaghetti sauce (winter). it turns very dark and shrinks. Maybe you could do with your taco meat/beans in an outdoor crockpot to keep kitchen heat down? ooohh this post has my mouth watering...i can't wait to join our local csa! i kinda wondered if all those veggied translate into lots and lots of cooking, which i never mind, but sure keeps a mama busy! I have a huge garden and hate to waste any of it. The summer months see me slipping produce into any and every dish I prepare. Luckily, my kids and husband are huge vegetable eaters and don't complain about any of it. I jazz up mac and cheese with peppers and onions; add grated zuchinni, grated carrots, chopped tomatoes, chopped peppers, or a combo of any of the above to jazz up a jar of spaghetti sauce; salads reign supreme in our home and I make them from every stinkin' combination fo vegies you can think of; stir-fries are huge in our home, also. I go easy on the meat and heavy on the vegies. Our favorite combo is chicken with brocolli, peppers, onions, carrots, and kale. I chop and freeze peppers and onions to have on hand for future cooking. I love roasting with olive oil and little salt because lets things that were overripe or on the verge have a second life--kind of like fruit cobbler for veggies. The mellow sweet richness that roasting produces is great for side dish, in salad, pasta soup, etc. We love this pasta dish for using up squash & tomatoes. Well, that link didn't work too well. Anyway, it's an old Southern Living recipe called vegetable-bacon noodle toss. I have been reading a lot about CSAs over the last year or so. I love to hear what works. Tacos are always a hit in our house. We are only just using up our eggplant from last summer. One cookbook I love to flip through is Verdura by Vianna LaPlace. Loads of (simple) ideas for veggies.